Loan Calculator Pro is the paid version of Loan Calculator. Trial is unlimited with ads supported. To remove ads and support further development of the app, please buy it. Buying a house or a car? Want to know your monthly payment or how much you can afford to borrow? Loan Calculator is the tool you need. Loan Calculator supports two calculator modes, general loan and mortgage specific loan. 1. Simple and easy to use, allowing you to quickly calculate monthly payment, interest, total payment, or how much you can afford to borrow. 2. 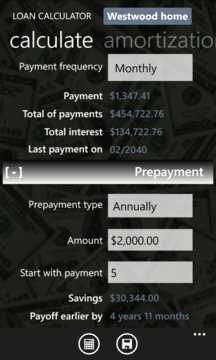 When extra payment is done, Loan Calculator calculates savings and how earlier the loan is paid off. Extra payment can be done one-time, bi-weekly, monthly, quarterly, semi-annually or annually. 3. Amortization table details each periodic payment, showing date, interest, principal and balance. Extra payment is highlighted if any. 4. Various graphs allow you to visualize and analyze your loan at different angles. 5. Ability to save loan along with descriptions and contact information for future reference. Phone call, email and Bing map/Nokia Drive feature integration allows you to quickly contact and locate dealers or property sellers. 6. Support multiple compounding methods, including Daily, Monthly (US and many countries), Quarterly, Semi-annually (Canada) and Annually. 7. Support multiple payment frequencies, including Bi-weekly, Monthly, Quarterly, Semi-annually and Annually. 8. Ability to send loan info to clients or friends via email, text message or social network. 9. 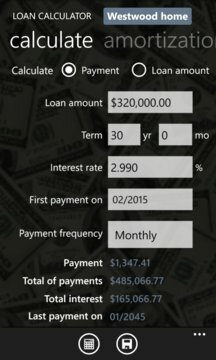 Ability to compare two loans side by side. 10. Live tile support to show your current loan summary right at the phone Start screen. 11. Mortgage calculator mode enables you to perform thorough analysis on your home loan. 12. Many more features, plus elegant design you need to check out to see.